Winter made a reappearance yesterday, to the delight of the boys who wrapped up warm and braved the patio to build a tiny snowman yesterday. Today however Ollie was poorly, so I decided that if he couldn't go to the snow, the snow could come to him. I scooped up clean snow into a clean bowl (the significance of making sure everything was pristine is that Toby treats snow as his own personal icecream factory). 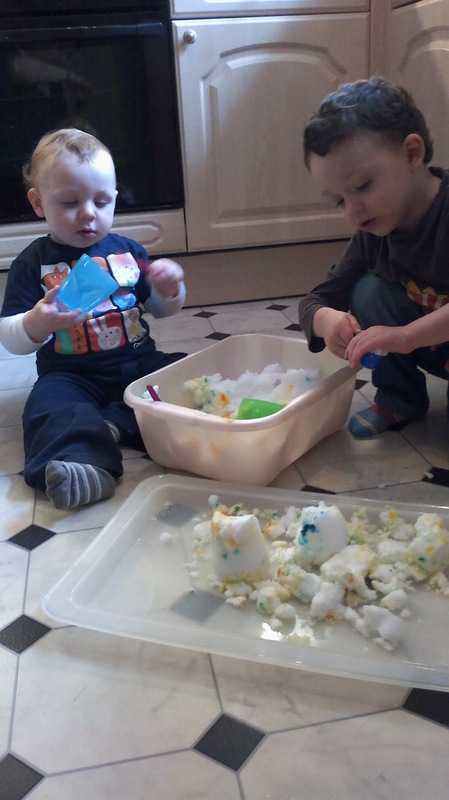 Initially the boys explored the snow with spoons and cups. After about ten minutes, I then added food colouring and vanilla essence to add a different dimension to their sensory experience. 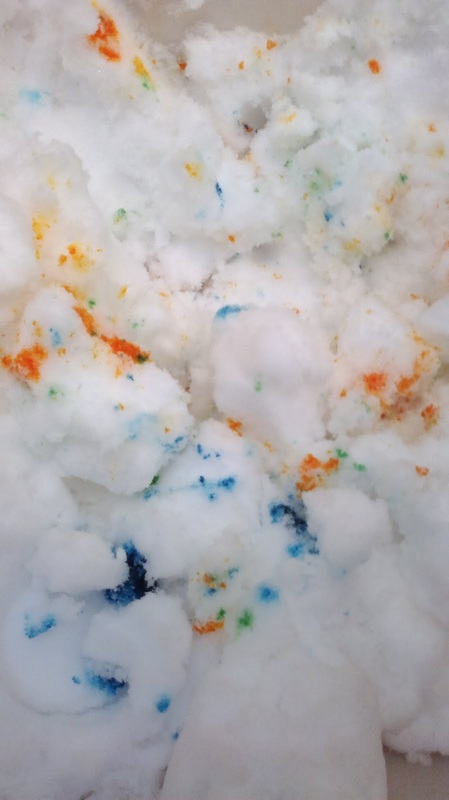 Ten minutes after that I got out a big plastic tray so we could transfer the coloured snow between the bowl and the tray. Finally, I got out some toy cars and Bob the Builder and we flattened the snow down into roads and played rescue truck where one car has to tow the other out of the snow. Building on the basic activity with new variations keeps kids interest for longer, which is especially helpful if it's an activity that has taken you time to set up, or will take time to pack away and clean up after. I've had plenty of experiences where the preparation and cleanup has taken longer than the actual activity itself. An example being playing in the snow yesterday - twenty minutes to get them ready to go outside (pre-parenting I would not have believed how long it takes to simply leave the house! ), ten minutes playing in the snow, then twenty minutes de-booting and de-coating them and mopping the floor where they'd shed snow all over it. Varying the activity also targets different parts of their experience of the materials you are using. The plain snow was interesting in itself and we talked about how it felt, and looked and tasted. Adding the food colouring and flavouring added new descriptive language and ideas for play. Building snow castles was Ollie's idea and developed on from the sand castles he spends all day making at nursery. Finally bringing in the cars stimulated more imaginative play, rather than the sensory exploration we had been focusing on. By looking at how his cars fared when driven over the snow, we talked about the difference the size of the wheels made, and what happened when we compacted the snow into an icy road. In total the activity lasted half an hour, with very minimal clean up time (Ollie even enjoyed drying the floor with an old towel). It could have stretched even further, but as Ollie already had a cold I thought that thirty minutes of playing with a cold material was enough, and followed up with his favourite 'warm hot chocolate milk' (half and half milk and hot water, with a quarter of a teaspoon of chocolate milkshake powder in it).